This house is uniquely South East Asian in style but there are always ways we can gain inspiration from our fabulously creative and talented neighbours. Shophouses are a prevalent building type in Singapore’s architectural and built heritage. They are also commonly found throughout the historic cities of South East Asia. They are narrow, small terraced houses, with a sheltered ‘five foot’ pedestrian way at the front. These buildings can be used for both business and living. Constructed between the 1840s and the 1960s,they formed the majority of the pre-World War II urban fabric of the old city centre, as well as several other parts of Singapore. These buildings are generally two to three storeys high, built in contiguous blocks with common party walls. 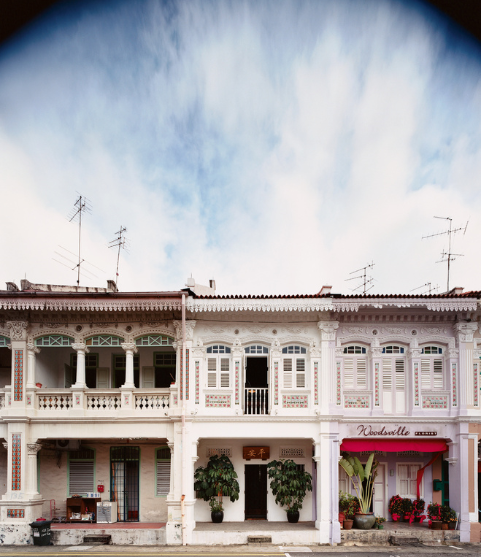 Shophouses, a historical source of delight and nostalgia, form the bulk of Singapore’s gazetted conservation buildings. Those still around today have been carefully restored according to Singapore’s strict conservation guidelines. “Shophouses brought back memories of our childhoods, of open back doors and neighbours and relatives wandering in and out of the kitchen and cooking and eating and coming and going whether you liked it or not.”—Yang Yeo (owner). This house, like many shophouses in Singapore, had fallen into a state of disrepair and was no longer being used for business. The couple purchased it in 2002 and three months later its roof collapsed. The couple have said that they did not want the design to be solely nostalgic. They wanted a home that reflected their contemporary modern taste. (Yeo is a fan and avid collector of Japanese pop culture and design.) Together with their team, consisting of architect Yong Ter, architectural consultants Teng Wui and Andrew Lee, and project manager Edwin Foo, they spent nearly two years discussing and hammering out their vision. 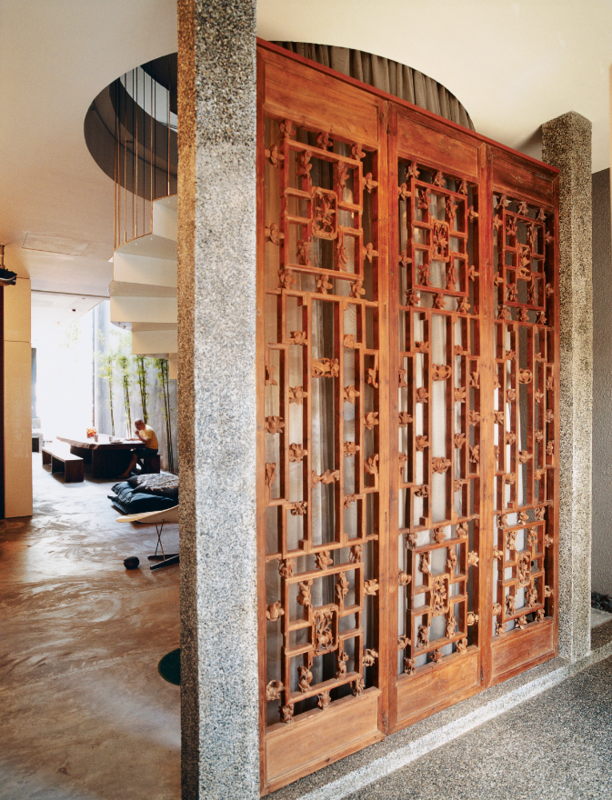 As you enter the house from the busy street, you step into a narrow entrance hall dominated by a screen made of three ten-foot-tall hand-carved antique panel doors (purchased by Yeo on a trip to Beijing). But behind this ceremonial entryway lies the unexpected!. The interior of Yeo’s house is a thoroughly minimal contemporary space of concrete floors, mirrored cabinets, low-slung furniture, dramatic glass-railed balconies, and a roof that opens to the sky. The government of Singapore is unique in Asia for its committed policy for conserving traditional architecture and preserving the overall character of its neighborhoods. Most renovations of older houses must be reviewed and passed by the Urban Redevelopment Authority, Singapore’s master-planning board. In Joo Chiat, traditional shop-houses may be renovated on the inside but the façade must remain intact. And so in this paticular case, the chipped pink-and-green ceramic roses that adorn the white façade had to be restored and repainted to match photographs of the original. However as these photos below bear witness, the interior offered limitless possibilities. The design of these old shophouses do present a number of challenges for designers as they are quite narrow and very deep—Yeo’s house is about 16 by 68 feet. The original houses usually were a progression of small, often dark rooms, designed so that light comes in through the front and back windows, and through a narrow airshaft located about three-quarters of the way back. In order to break that pattern, and to create a more open living space, the team decided on a radical move: to leave the roof completely open from the beginning of the original airshaft to the back of the house. 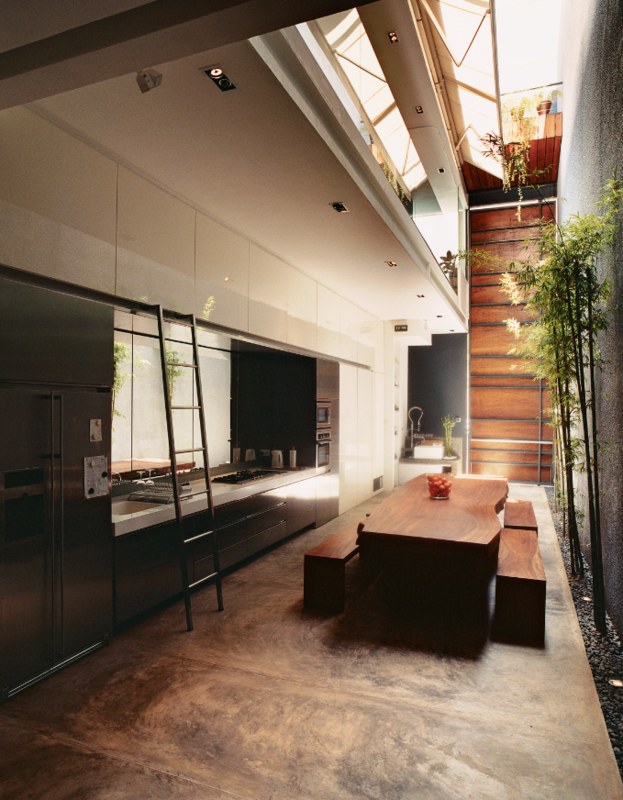 The kitchen/dining area is located in an open-air space, however, as Singapore has frequent tropical rains, the house’s “sky window” can be easily and quickly sheltered by two retractable motor-driven beige canvas canopies that open above. 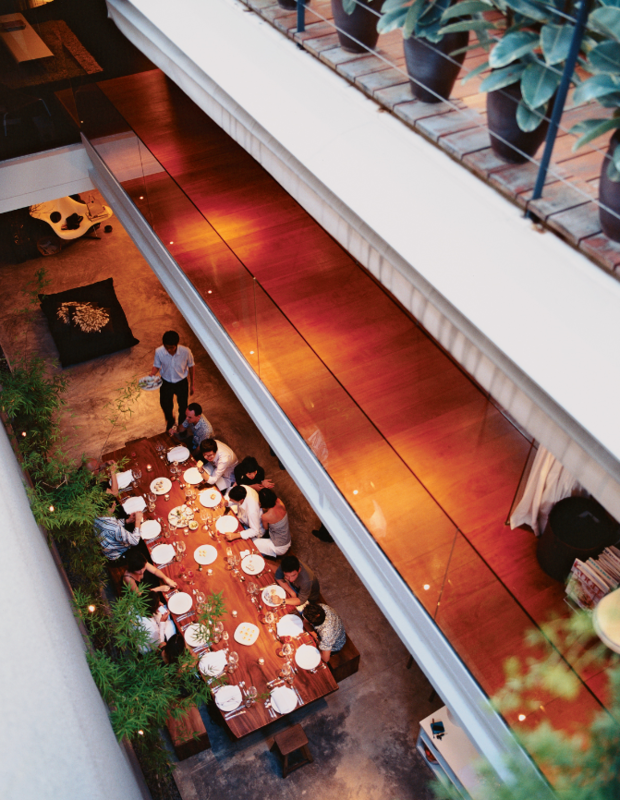 This space is described as the heart of the house and is dominated by a dramatic, 13-foot-long table from Indonesia made from a single piece of teak. Guests are encouraged to drop in through the open back door which is 25 feet high and wall-like. “It represents a transformation of scale,” explains architect Wui, in direct contrast to the smallish rooms of the original house. “You have a giant table, a giant door—and Yeo’s giant personality.” The openness of the vast, long space is the way that Yang and his team reinterpret and pay homage to the commercial function of the traditional shophouse’s ground floor. 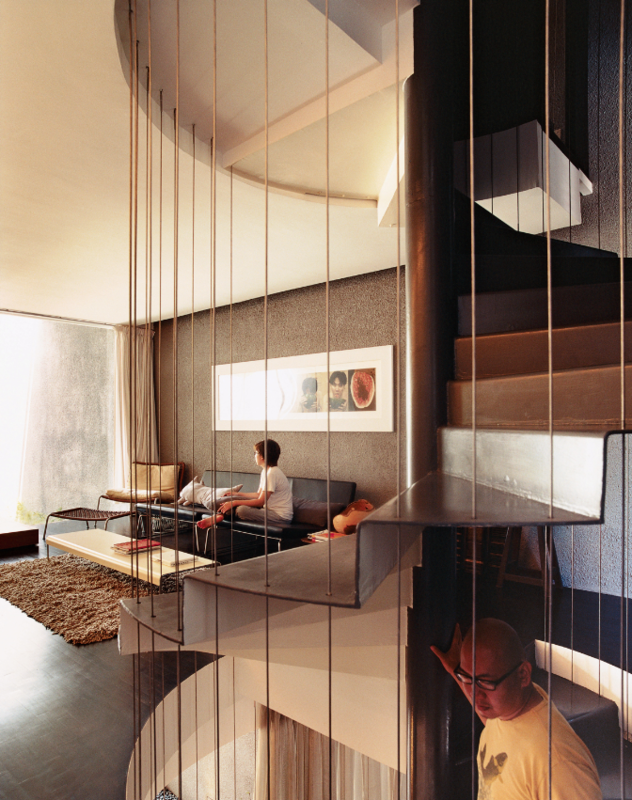 A steel spiral staircase just inside the entrance hall leads upstairs into the private spaces. On the second floor is Yeo’s study and a media room. On the third floor is the bedroom and an outdoor bathroom built on a wooden deck, complete with open-air toilet and a whirlpool bathtub. 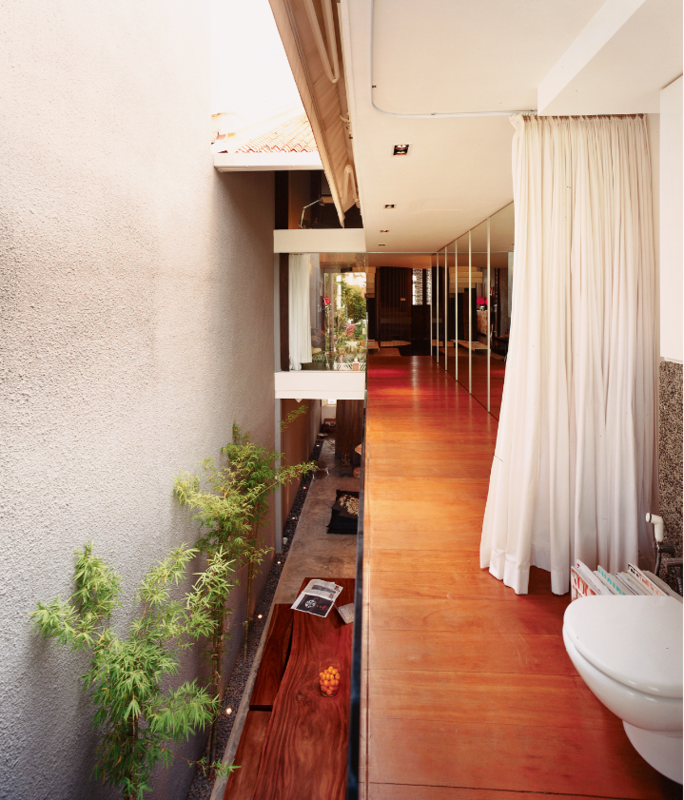 It is a contemporary twist on the traditional tropical Singapore outhouse. On both floors, balconies offer views down into the grand ground-floor space, and up towards the open sky. Apparently, Yeo and Ian have purchased another shophouse which they intend to renovate in a more child friendly way. Watch this space! 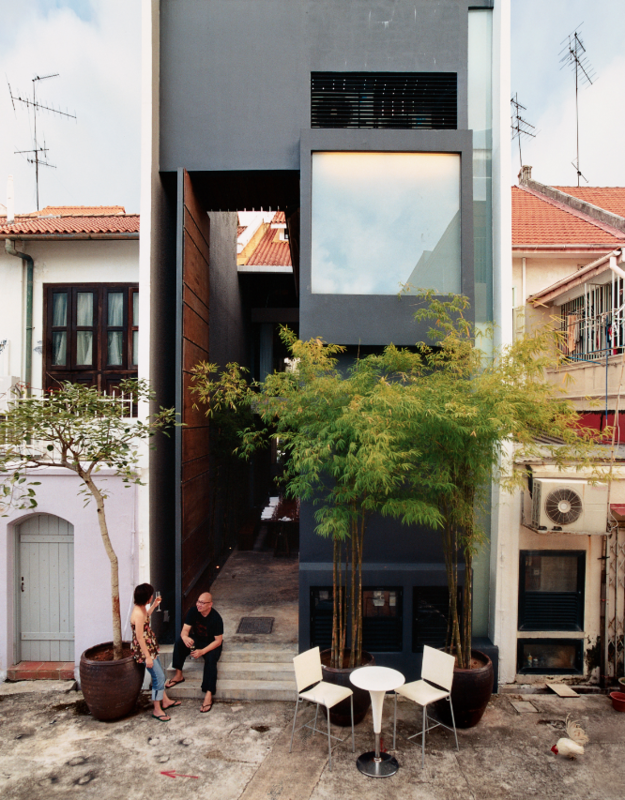 Sources: Singapore Urban Redevelopment Authority website: http://www.ura.gov.sg/uol/conservation/vision-and-principles/The-Shophouse.aspx; 'Straight and Narrow', by Daisanne McLane for Dwell Magazine. http://www.dwell.com/house-tours/article/straight-and-narrow, June 2006.